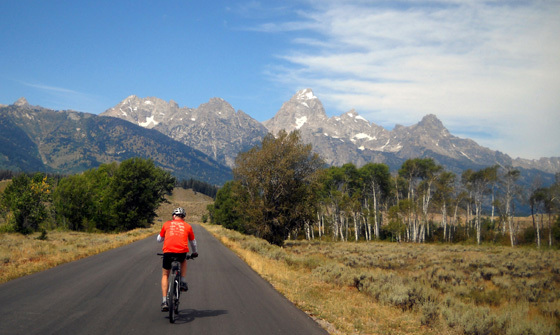 WEATHER OR NOT: JUST GET OUT & DO IT! ~ Martial, Roman poet who wrote Epigrams in 86 A.D. This was our third overcast and/or rainy day in a row in the 50s F. We knew inclement weather was coming so we did longer hikes and bike rides on Friday and Saturday when the weather was nice. We were tired enough from hiking and cycling that we didn’t go out on Sunday except to hunt for a new camera in the afternoon. My Canon Power Shot digital camera sounds like it's about to self-destruct -- I've dropped it one too many times. After spending most of Sunday and Monday doing indoor activities we were getting cabin fever and simply had to get outside today to exercise more than just walking around the campground and Big Box stores. We’re already tired of rain and we've been in Alaska only two weeks. The one good thing about a cloudy day/night is that our camper is darker when we’re trying to sleep. 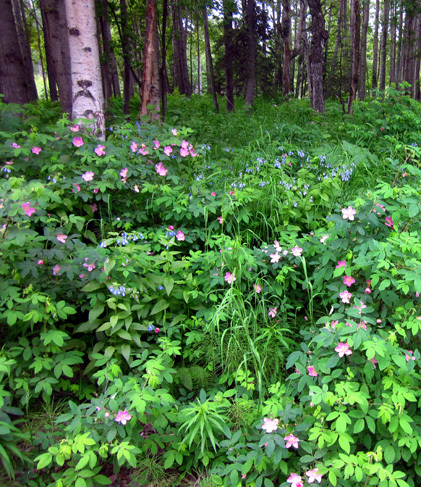 The summer solstice occurred last week; Anchorage has more than 20 hours of daylight every day now. Sunday was the first night in a while that was darker when we went to bed. Sunset was about 11:40 PM but we couldn't see it because of the clouds. Even though it’s also darker when it’s overcast in the morning I’m still waking up too early. That started soon after we got as far north as Canada. I often get up at 6 AM, feed Cody and walk him in the campground, and get on my computer while enjoying my coffee and breakfast. Once I'm awake I prefer to just get up. If Jim wakes up early he usually stays in bed till 7:30-8:30 AM, either snoozing or listening to his MP3 player. 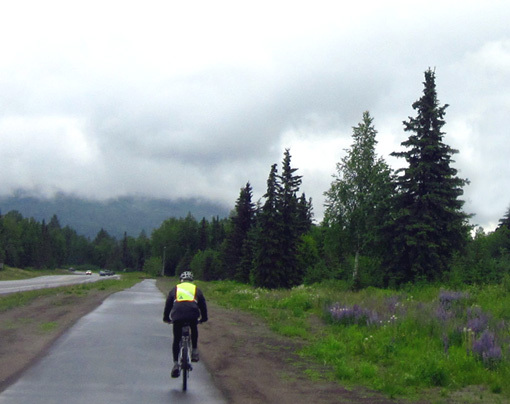 Despite 57-degree F. mist and rain we got out to ride our bikes around JBER before lunch. 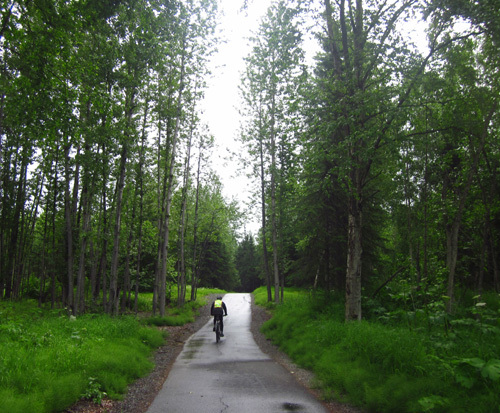 Riding in the rain was more pleasant than I expected. It takes more effort for me to get out on my bike (especially in wet weather!) than to go for a walk but I almost always enjoy riding when I’m actually doing it. Jim's already done several fairly long rides around JBER and knows his way around quite well. 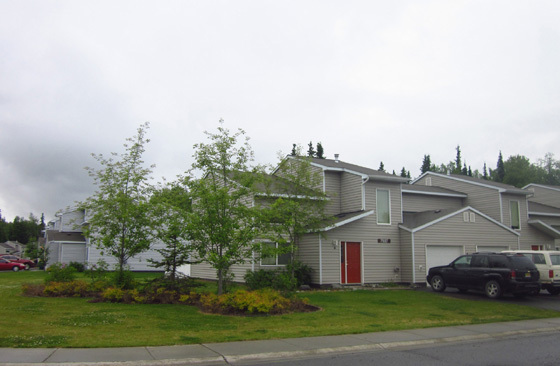 There is some attractive housing for enlisted troops and officers and their families on base. 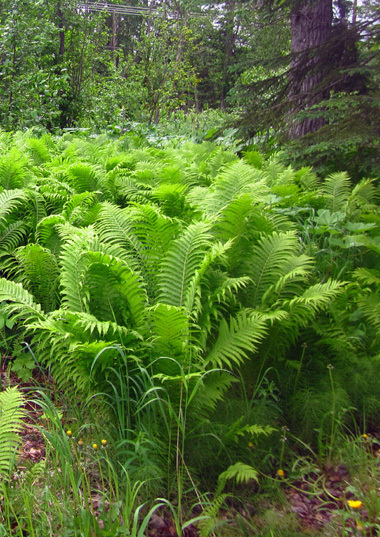 Some of the plants are so lush and large – 2-foot tall dandelions (most are puffs now), 2½-foot lupines, 4-foot ferns, 5-6-foot cow parsnips . . .
That's what lots of rain and 20+ hours of daylight in the summer will get you! I'll show some more pictures from our bike ride throughout this entry. 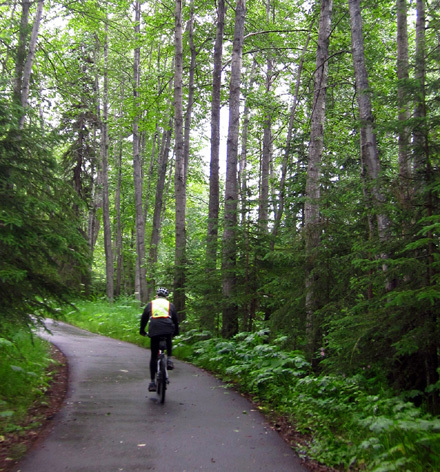 We’ll probably go for a ride on the Coastal Trail or at Turnagain Arm tomorrow even if it’s cloudy and/or raining a little bit. Clouds and/or rain are predicted for the next week. We can’t just stay inside all the time. There’s too much to see and do! We really can’t complain about cool, little-bit-rainy weather. It's much worse in other parts of Alaska and the Lower 48 states. There is a large wildfire in northern Alaska, where it's been too dry, and flooding in some other parts of the state. 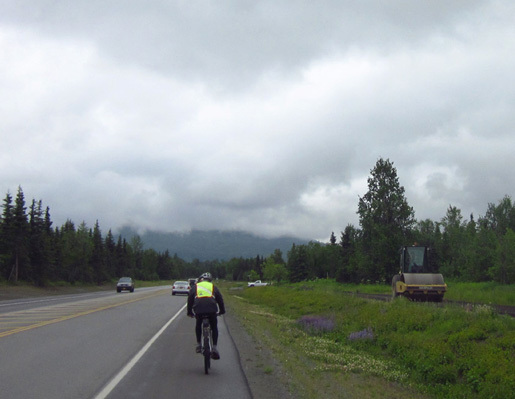 And even in late June snow continues to cause problems in the Anchorage area. South Central Alaska had record-setting levels of snow this past winter. I saw this article on the Alaska Dispatch website this morning about folks who’ve gotten injured recently on snowfields in the Chugach Mountains east of Anchorage. Remember in my entry about Flattop I noted how popular it is and showed photos of snow on the way up the trail? And my comments Saturday during my Rendezvous hike about being very careful sliding down snow banks? 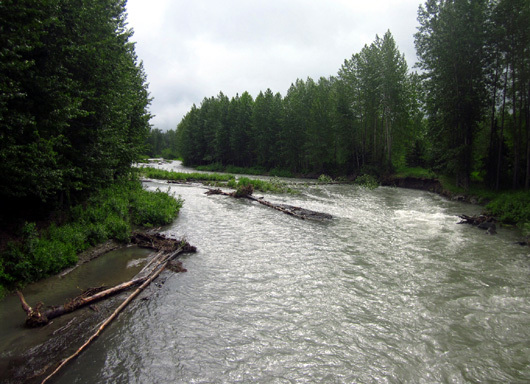 The bike path bridges Ship Creek more than once as they both meander through JBER. Flattop Mountain -- a distinct, 3,510-foot summit about two miles northwest of Ptarmigan -- has become not only the most climbed mountain in the state but also the one that sees the most falls. 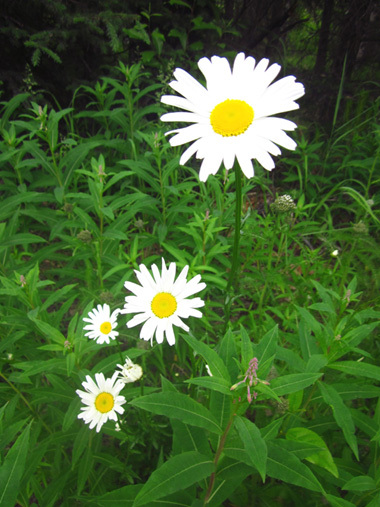 A large snowfield along the trail to the summit has become an enticing trap for many. Tempted into sliding down on the snow, people start off slowly, quickly accelerate and find themselves rocketing toward rocks. In mid-June, chief park ranger Matt Wedeking observed it was only by luck there had as yet been no one seriously injured sliding on the late-season snow in the Front Range . . . There were at least three helicopter rescues in and around Flattop in the last week. Ranger Tom Crockett, the longest serving Chugach ranger, said rescues in the area have unfortunately become a normal and regular thing. 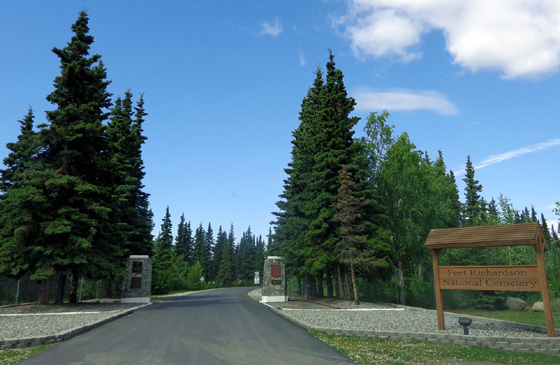 The park's Glen Alps trailhead at the base of Flattop above Anchorage now attracts approximately 130,000 visitors a year. Many of them are physically or physiologically ill-equipped to climb any mountain. But some decide to try climbing one of the nearby peaks anyway . 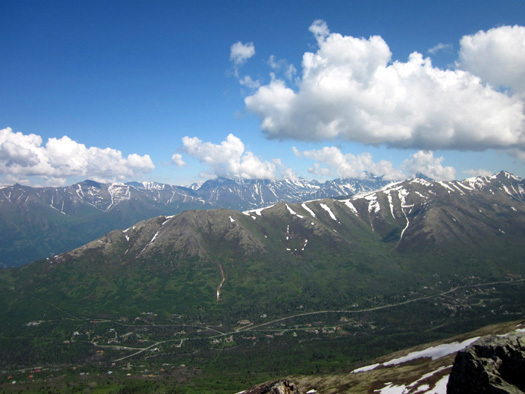 . .
Other hikers who were out in the Chugach on Thursday noted the peculiar danger of some snowfields. Although the day was warm and sunny, they said, there were still some bands of ice around the edges of most snowfields. A couple veteran hikers reported taking falls after slipping on unexpected ice. Both were equipped with ice axes and -- just as importantly -- trained in how to use them. They managed to stop their slides almost before they began. But they were reminded of the dangers of those white paths that seem to offer such an easy routes to the tops of many peaks. When we were on Flattop Friday we saw a helicopter flying around; we don’t know if it was involved in any of those rescues or not. 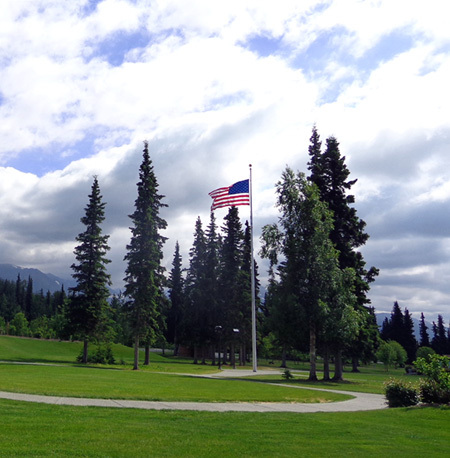 Alaska certainly has no monopoly on weather-related problems this month. Down in the Lower 48 Tropical Storm Debby is wreaking havoc on Florida and Georgia, dropping 15” of rain in one day near Tallahassee. I-10 is or was closed. Some places were getting 5” of rain an hour during the height of the storm. Farther north it is very hot in the Midwest and all along the East Coast. Roanoke, where we own a house, is expecting temperatures near 100 F. several days later this week. That's unusually hot for the Blue Ridge Mountains, especially in early summer. and a newly-paved section is open to ride on (below). 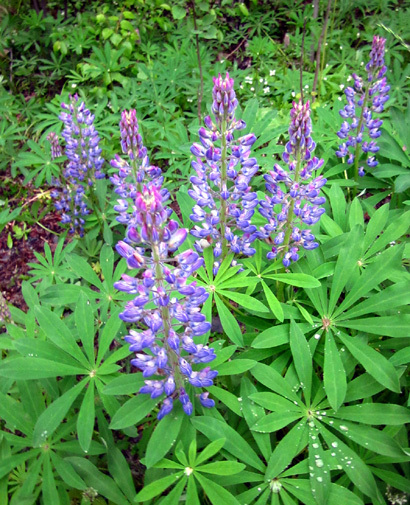 Note the blue lupines blooming to the right. At the other extreme it is so dry out West that there are several states with wildfires raging out of control. Colorado is the worst, with major fires near Ft. Collins and Colorado Springs. By this afternoon the USAF Academy was evacuated. Wow – that means one of our favorite campgrounds is possibly in danger. One of the evening news stations showed flames that could be seen in the Rampart Range from the Academy. Garden of the Gods Park is threatened, too. We really hate to see these beautiful areas devastated, to say nothing of the loss of life and property. Numerous homes and other structures in AZ, CO, and other states have burned down. Wow. Seems to be either feast or famine as far as rain is concerned. Although it was quite cloudy this morning and it rained for about an hour we could see sunshine and some blue sky by mid-afternoon and throughout the evening. Too bad it wasn't that nice during our bike ride! I went back out with Cody for a short walk in the afternoon to enjoy the sun. After supper Jim went to the library to return the series of war films he borrowed and to get some new movies to watch on rainy days. 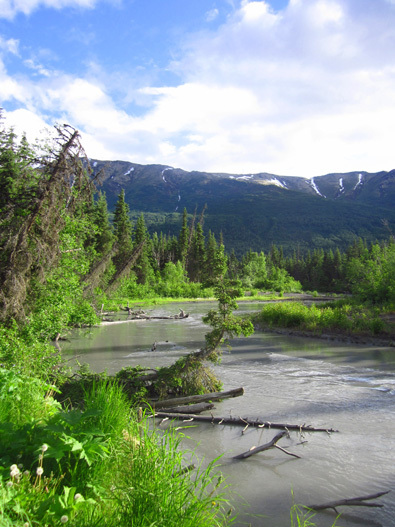 After he left I walked Cody again in the campground and got the bright idea to take a drive through one or both of the Eagle River valleys a few miles north of JBER. There is a North Fork and a South Fork. I didn’t want to waste the nice weather since more rain is expected tonight and for several more days. I called Jim with my idea and he was game. He realizes, too, that we need to be flexible and take advantage of whatever sunshine we get. Jim came back to the campground about 7 PM to pick up Cody and me. We took the Richardson Hwy. 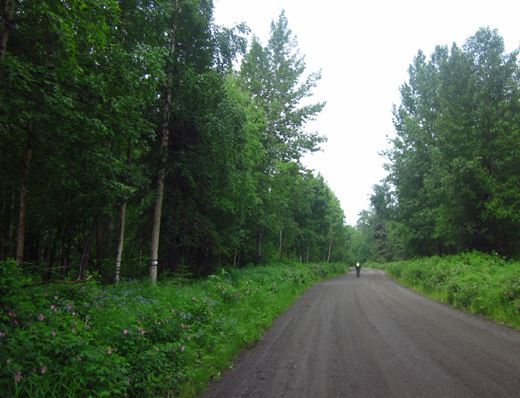 to four-lane Eagle River Loop Road near the town of Eagle River. I wanted to see if I could show the peak to Jim from the valley. I think I found its rocky summit but my pictures of the peak and ridge didn't come out well because I was facing the sun. We got up to about 2,100 feet on the little paved road, which you can see in the picture above. We drove back about seven miles before the road dead-ended. I was disappointed that we couldn't see much of the river. 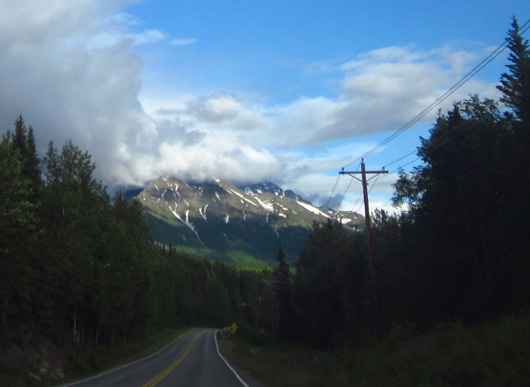 After we drove back to the Eagle River Loop Road we turned right, drove north a little ways, and turned right again on Eagle River Drive. There is a large Super WalMart store at this intersection so it's easy to find. 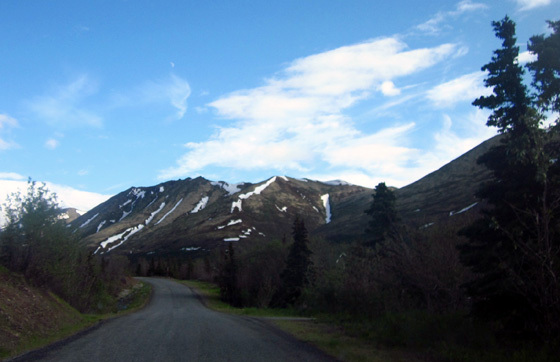 Eagle River Drive goes for about 11 miles into the valley that contains the North Fork of the Eagle River. 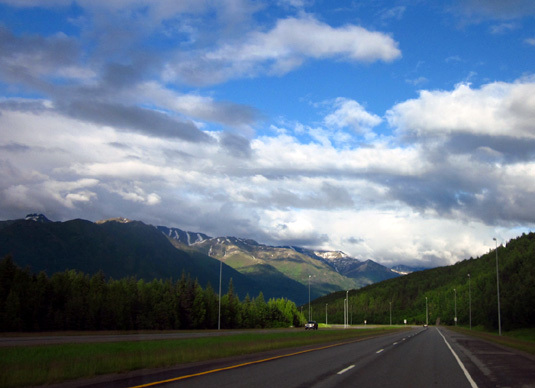 That valley kind of parallels the South Fork Valley but is separated from it by more Chugach peaks. 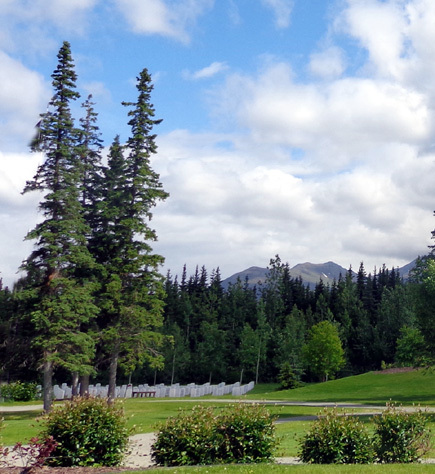 It’s a beautiful area with 7,000-foot mountains, snow on the peaks, and some glaciers. 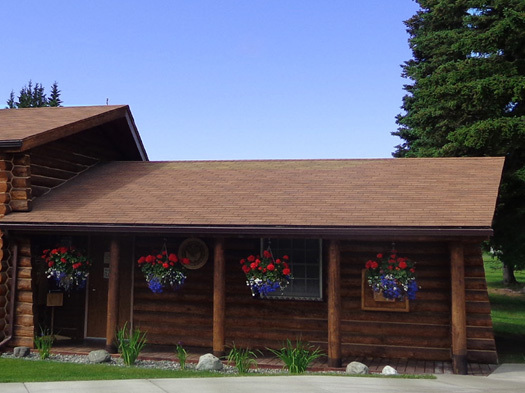 The homes in both valleys and up on the hillsides range from simple cabins to luxurious multilevel homes. It'd be a great place to have a summer home. 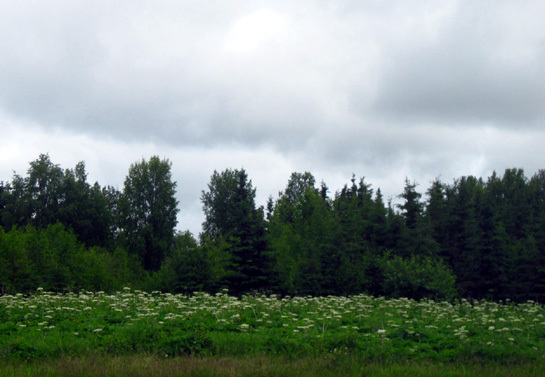 We didn’t go all the way back to the Eagle River Nature Center at the end of Eagle River Rd. The road is paved but bumpy and Jim didn't want to drive another five miles in. 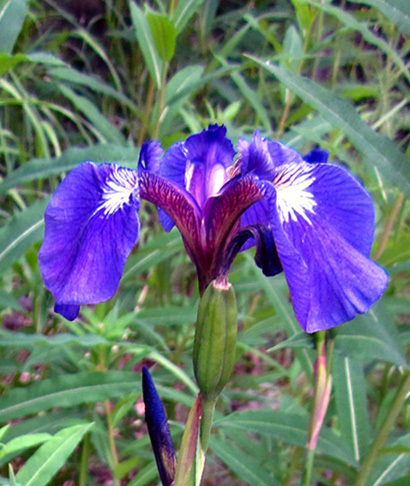 I might go back to the nature center another day in order to access some of the trails through the valley. We stopped at the North Fork River Access parking area (above), a $5 fee area for day use to picnic, hike the trails, fish, put in a raft or canoe, or just hang out. All we did this evening was walk down to the river for a few minutes. 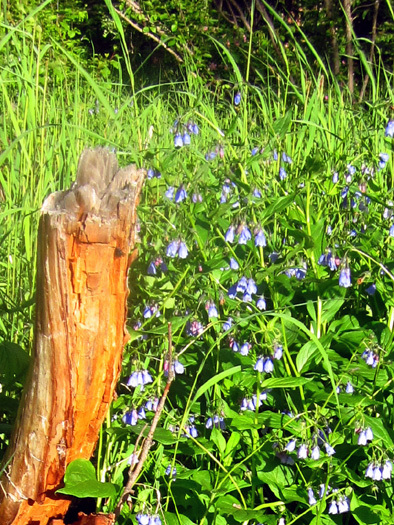 I showed two pictures of the river and some wildflowers at the beginning of this entry. 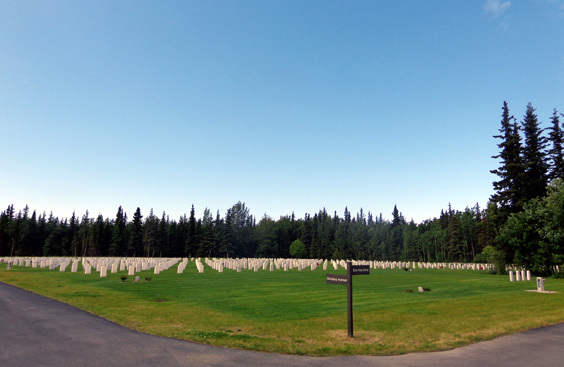 On the way back through Joint Base Elmendorf Richardson to our campground Jim took a detour to the very large and scenic Fort Richardson National Cemetery. Thousands of veterans are buried there. Colorful hanging baskets full of flowers brighten the building near the entrance to the cemetery. The cemetery is located in the NE part of the base and it is open to the public. The closest gate for visitors to enter JBER to tour the cemetery is the Richardson Gate. I was hoping to go back one day on my bike to take pictures but bikes aren’t allowed in the cemetery. Neither are dogs. I did drive through again in the truck several days later earlier in the day and took the pictures shown in this entry. They are better than the ones I took on our initial drive through the cemetery tonight when the sun was getting lower about 9 PM. It began raining lightly as we drove back to our campsite. We could see a little bit of a rainbow toward the mountains. 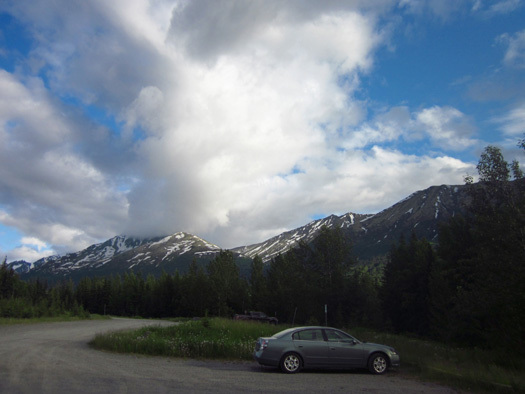 When we got to our site it was raining lightly behind us – but not on our camper! It looked very cool in the sun, like liquid snow softly falling. It was so unusual to be right beyond the edge of the rain for several minutes. I wish I could have gotten a picture of it (I tried). Here's another observation I made recently while perusing my AAA Alaska map. The International Date Line just west of Alaska . . . must mean we are in the last time zone of the day. Cross that line and we’re into tomorrow!